1,500 Scientologists gathered April 2 to exuberantly celebrate the opening of the Ideal Church of Scientology of Atlanta, where Southern hospitality meets the Church’s spiritual technology. Chairman of the Board Religious Technology Center, was on hand to lead the dedication ceremony of the new Ideal Church of Scientology of Atlanta. Under Mr. Miscavige’s vision and leadership, the Church of Scientology has opened the doors of more than 50 new Ideal Churches. Those openings have been the sparkplugs of worldwide expansion for the religion—greater in the last decade than in the previous 50 years. The Church of Scientology Atlanta was dedicated April 2, 2016, before an excited audience gathered to welcome the Church to its elegant new home. As the ribbon fell, signifying the official opening of the Church, the audience broke into thunderous applause, elated to join the league of Ideal Scientology Orgs in an era of unprecedented expansion for the Scientology religion. A rousing performance of “Georgia on My Mind” kicked off the grand opening ceremony. —Rev. Dr. James Milner, Founder and Executive Director, Community Concerns Inc.
Mr. David Miscavige, Chairman of the Board Religious Technology Center and ecclesiastical leader of the Scientology religion, with (left to right): Mr. Orlando Johnson, Director of Agape Community Education and Resource Center; Georgia State Senator Donzella James; Ms. Pamela Perkins Carn, Executive Coordinator, Interfaith Children’s Movement of Atlanta; and Rev. Dr. James Milner, Founder and Executive Director of Community Concerns Inc.
Like a phoenix rising, Atlanta is a city of amazing triumphs—and the latest herald of the city’s “we can do it” is the April 2, 2016, opening of the Scientology Ideal Church. Under Mr. Miscavige’s vision and leadership, the Church of Scientology has opened the doors of more than 50 new Ideal Churches—from Los Angeles to Tampa, London to Milan, Johannesburg to Tokyo, Moscow to Kaohsiung. Those openings have been the sparkplugs of worldwide expansion for the religion—greater in the last decade than in the previous 50 years. “Today honors a tale of Ideal Org creation that epitomizes Ideal Org spirit,” Mr. Miscavige said just before cutting a giant ribbon that officially opened the Atlanta Ideal Church of Scientology Organization. 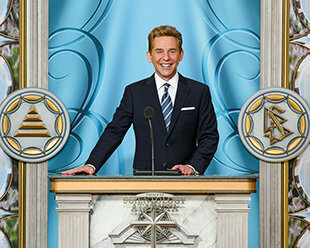 Mr. Miscavige’s speech evoked the deep history of Georgia, a state stained by the bloodshed of war and hatred, yet equally glorified by an abiding dedication to the emancipation of human bodies, minds and souls. Atlanta, Georgia’s capital—indeed the commercial hub of the New South—arose like the phoenix, reconstituting itself many times, reaching higher and higher to lift up its citizens. Here, in the most recent decades, was the birthplace of a human rights crusade that transformed America and astonished the world. Here was forged Atlanta’s motto: “Resurgens,” denoting a city rising proud, strong and free, undeterred by adversity. And here was crafted a beloved proverb about Atlantans: It’s a city too busy to embrace hatred. And here now, in 2016, is another testament to the liberties that are the birthrights of all women and men: The Scientology Ideal Church of Atlanta. “Ideal” was the standard set by Scientology Founder L. Ron Hubbard so that every church could be a perfect expression of the religion’s principles and practices. The new home of the Church is located in the Atlanta metropolitan area and the City of Sandy Springs, atop a rise overlooking the bustling Roswell Road. The 45,000-square-foot Williamsburg-style mansion speaks “Southern charm” and welcomes all from Atlanta and beyond. Joining the Church’s opening celebration were 1,500 Atlanta Scientologists, plus those from along the Eastern Seaboard. Also attending were leading voices of the Atlanta community who welcomed the Church to its new home: Pamela Perkins Carn, Executive Coordinator for the Interfaith Children’s Movement of Atlanta; Mr. Orlando Johnson, Director of the Agape Community Education and Resource Center; the Rev. Dr. James Milner, Founder and Executive Director of Community Concerns Inc.; and Georgia State Senator Donzella James. “Your contribution to put this Church here is most certainly a great investment for a stable society,” Rev. Milner emphasized. And, Senator James spoke of the loss of her sister at the hands of psychiatry. “There was nobody on our side … until you came to the halls of our state capitol with Citizens Commission on Human Rights and the Psychiatry: Industry of Death exhibit. The new Atlanta Ideal Org provides visitors with an introduction to Dianetics and Scientology, beginning with the Public Information Center. Its displays, containing more than 500 films, present the beliefs and practices of the Scientology religion and the life and legacy of Founder L. Ron Hubbard. Atlanta’s Ideal Org also features a chapel that provides for Scientology congregational gatherings, including Sunday services, weddings and naming ceremonies, as well as a host of community wide events open to members of all denominations. The Ideal Org further includes multiple seminar rooms and classrooms, in addition to an entire floor dedicated to Scientology auditing (spiritual counseling). The Atlanta opening continues an explosive growth period for the Church in the past 12 months. And more is on the way, with openings in the coming year planned for cultural epicenters in Australia, New Zealand, Europe and North America.